Posted by MORSE Team - 3 min read. One new drug product was added to the “No pCPA Negotiations” list, for a total of 58 products for which the pCPA has decided not to negotiate collectively or individually at the provincial-territorial level. In addition to the monthly updates to the pCPA website, MORSE Consulting tracks the number of products “under pCPA Consideration” which have been reviewed by CADTH but have not yet been initiated for negotiation or closed without negotiations. This chart shows the average number of months, files are under pCPA Consideration. 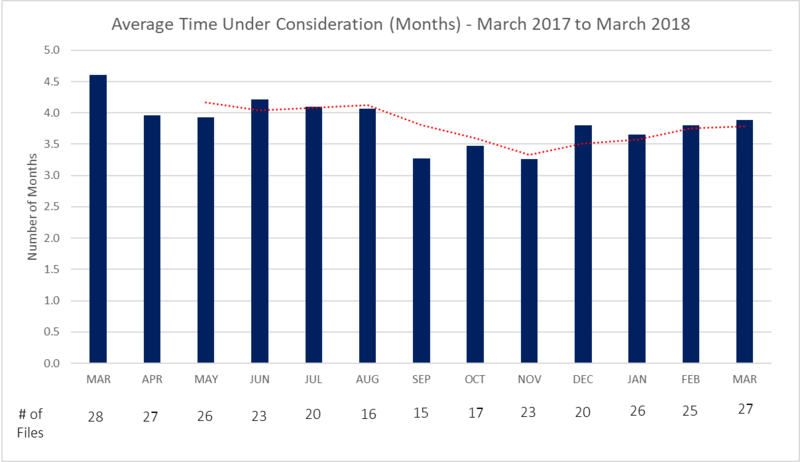 The number of files under consideration in each month is shown below the x-axis and the line shows the 3-month moving average trend. The bars show the average number of months all files, currently under consideration in that particular month, have been in that phase. This includes files that are either closed without negotiations and files for which negotiations are eventually initiated. Phrased another way, the 27 files under pCPA Consideration in March 2018, have been awaiting a pCPA decision for an average of almost 4 months. Four new drug products received a CDEC or pERC recommendation or notification to implement in March 2018, for a total of approximately 27 products under pCPA Consideration. The March negotiation initiations continue to be a mix of pCPA-initiated files (including one “line-extension” and one re-negotiation) and new drugs that have been under pCPA Consideration, post-HTA recommendation). Two negotiations have been completed since the last update, for a total of 207 joint completed/closed negotiations. 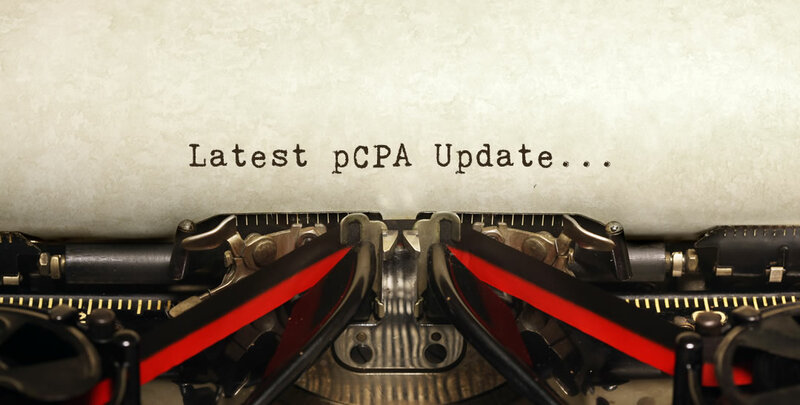 The March update includes the latest subsequent entry product (Glatect-glatiramer) to be successfully negotiated, while the negotiation for Copaxone (glatiramer) continues. 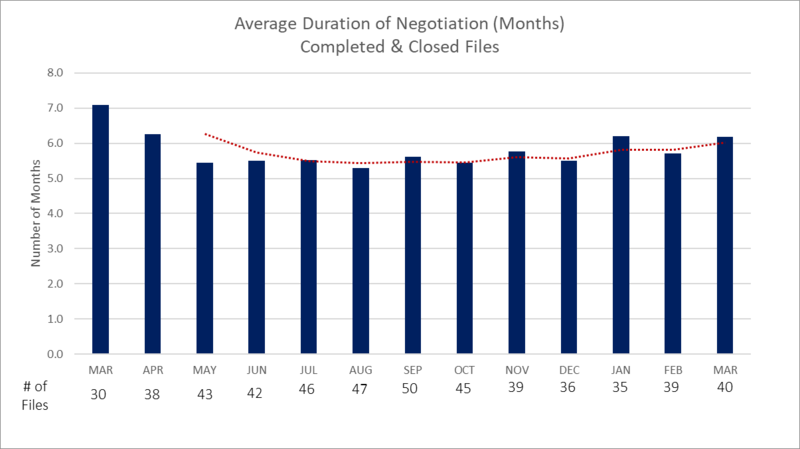 This chart shows the average number of months, files are under active negotiation. The number of files being negotiated during each month is shown below the x-axis and the line shows the 3-month moving average trend. The bars indicate the average number of months all files, currently under active negotiation in that particular month, have been in negotiations. This includes files that are either eventually completed or closed without a Letter of Intent (LOI). Phrased another way, the 40 files under active negotiation in March 2018, have been in negotiations for an average of more than 6 months.